What's up! This time it's a comic of sorts. 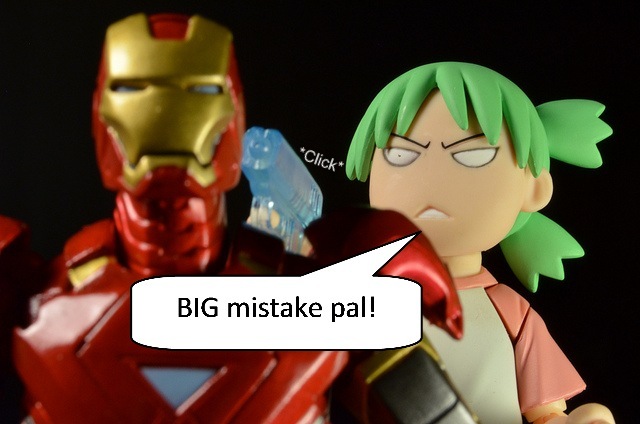 I'm mostly making this to use my recently acquired Iron Man mk. 6. He has not hands to hold stuff! Had to tape that. 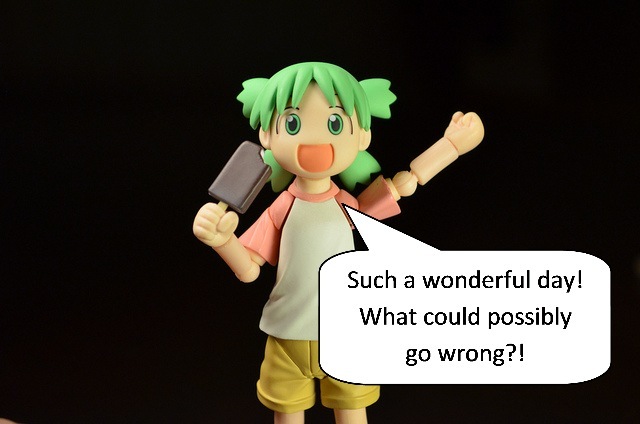 Yotsuba is still in shock so she hasn't reacted. 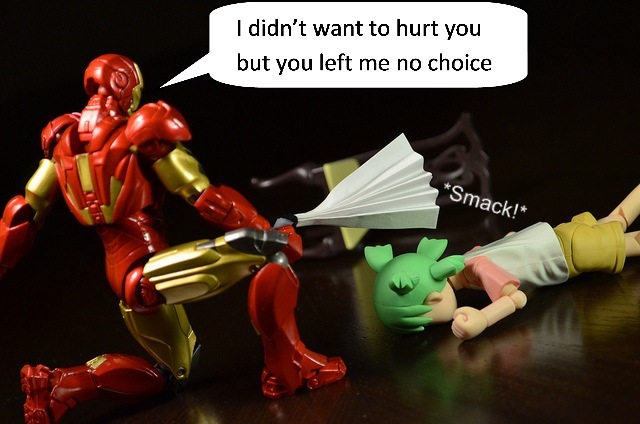 So Iron Man has way to many joints. 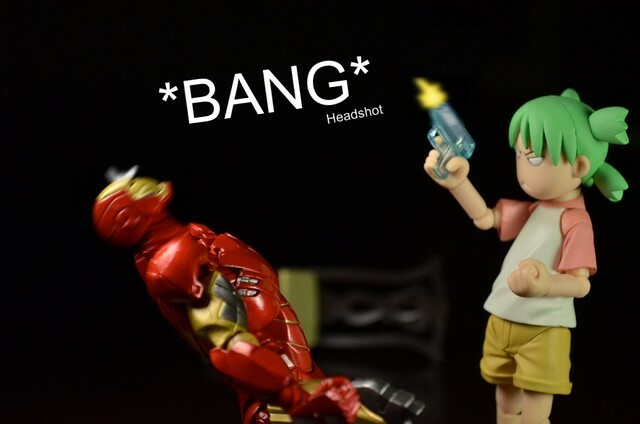 And it's kinda harder to pose than your regular articulated figure. 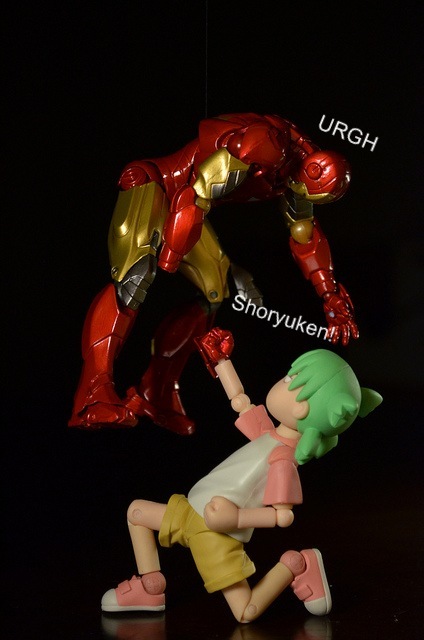 Harder than Figmas anyway. Yotsuba is standing on Kuroneko's chair here by the way. Making speech bubbles is pretty time consuming. I should get a dedicated comic maker... I tried one out but the trail was kinda limited. I should stop being stingy and get it. Haha I love this one. Effects courtesy of Miette. Don't worry folks! He's OK! 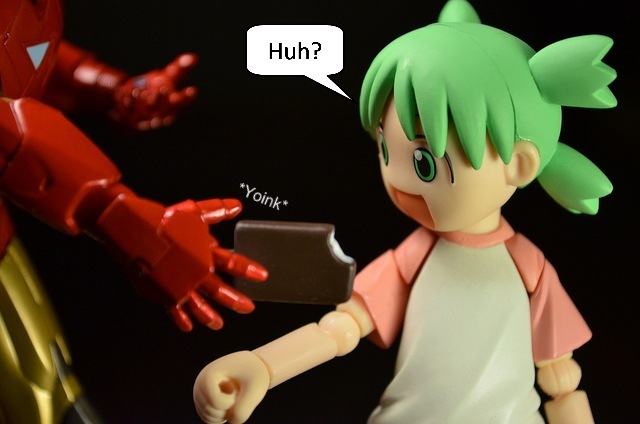 Yotsuba had a little speck of dust or something in her right eye when I took the photos. Kinda makes her look a little more freaky so I left it. This one was fun to set up! Hope your monitors aren't too bright! Or else it ruins the illusion. 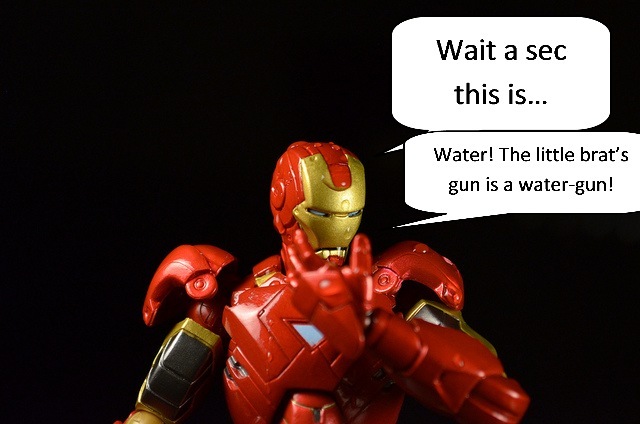 So as I was saying a couple pictures ago, Iron Man can be a pain to pose. He has way too many little joints to move and position. What do you mean I need to know basic anatomy to pose figures?! 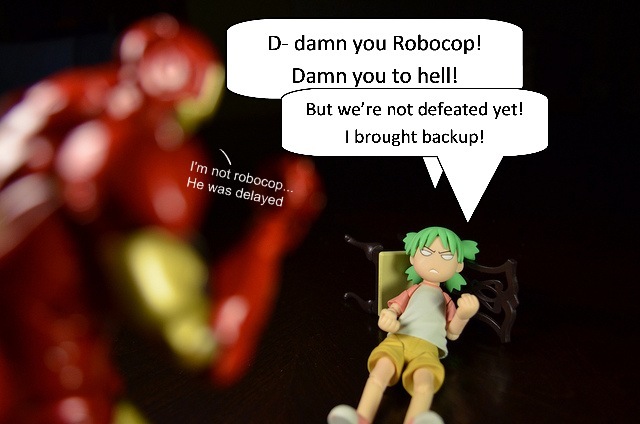 Yotsuba was confused on who she was fighting all this time. 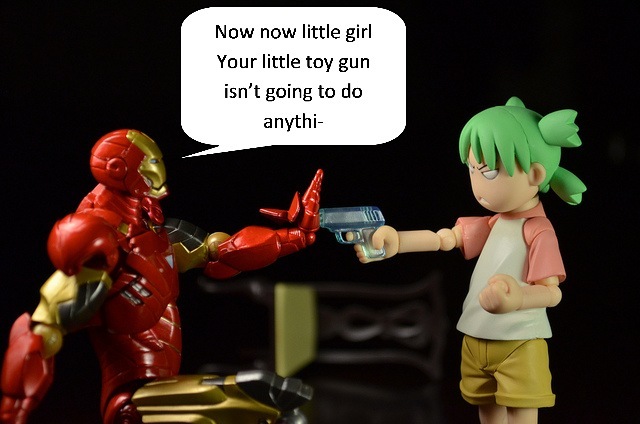 Also, the Robocop Figma was delayed. Much to Miette's dismay. A sudden turn of events! 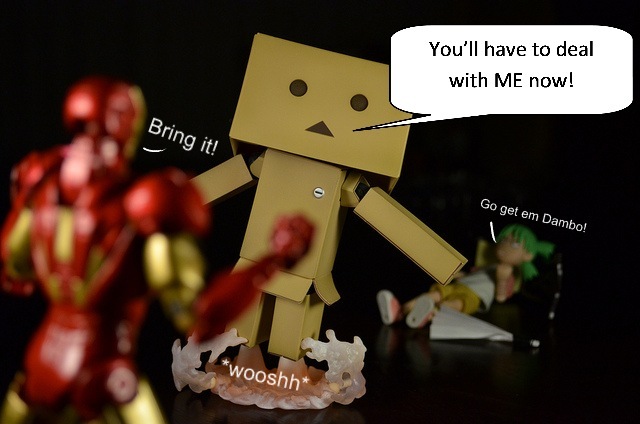 Danbo flies in out of nowhere. Because he's a robot. 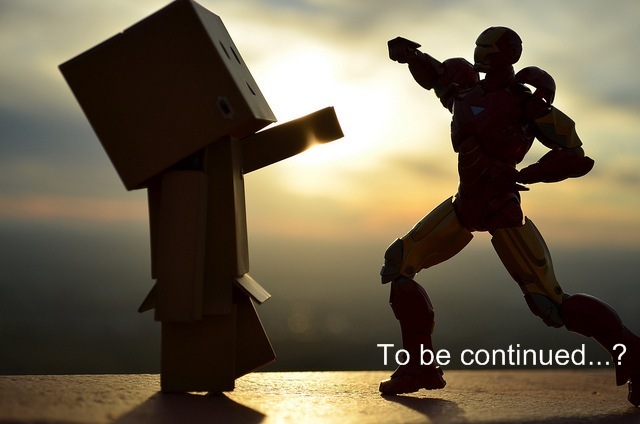 Will Danbo defeat Iron Man? 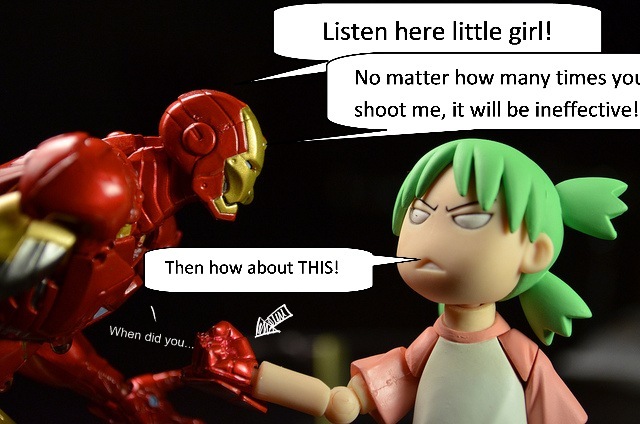 Will Iron Man ever stop being such a prick to little girls? 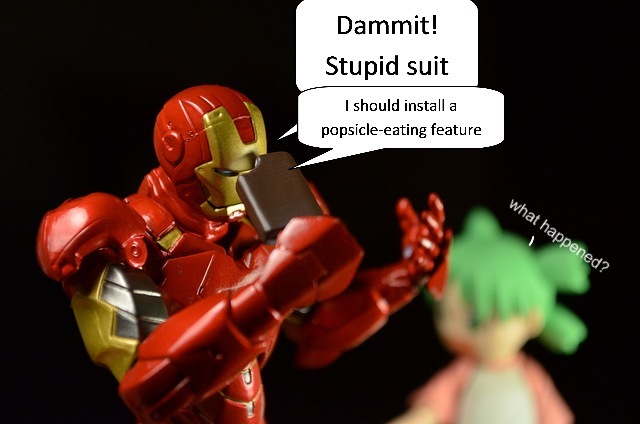 Will he ever install that Popsicle-eating feature? Why are they suddenly outside? Tune in next time when we will answer all zero of those questions!